Take your design skills to the next level by learning the principles behind colour theory, type theory, and more! yeh! I want to be a design pro! You don’t need to go to design school to know the principles that keep designs looking good, not cluttered. Learn from us, designers(!) about the core theories that’ll keep you creating high-level designs in Canva, Photoshop, Illustrator and even on your website! You’ll no longer feel confused by the jargon, instead you’ll be confident and ready to take action! Wear all the hats for your business like a pro - with new knowledge of design principles and theories that’ll make your designs stand out. Two designers with a flair for entrepreneurship - and teaching! 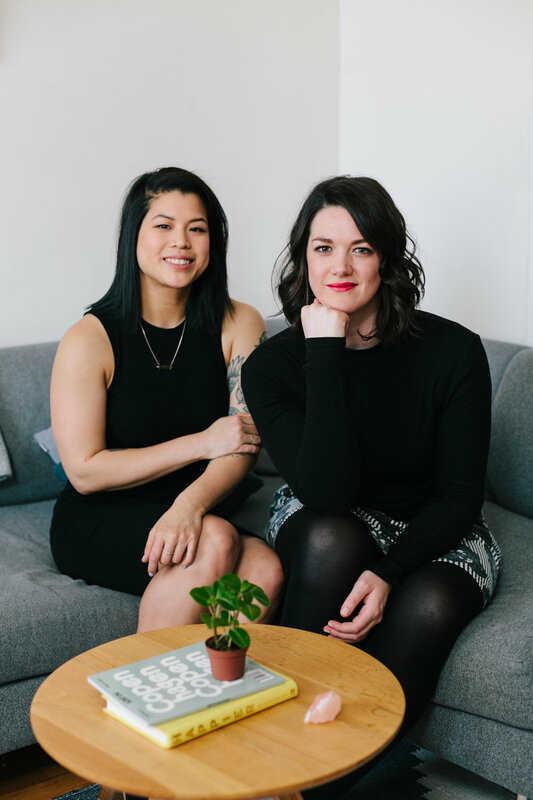 We’re Daphne and Lucy; co-founders and designers over at Salt Design Co.
We’re also very much humans: Netflix bingers, podcast lovers, geeks about entrepreneurs, CrossFit addicts (Daphne) and puzzle enthusiasts (Lucy). BUT, when it comes to our work, we’re on a mission to demystify the glam and jargon that comes with building a business, and to make things easier for you: the small business owner who’s smart as a whip, a real go-getter, keen to learn and grow your skills and scale your business without losing your life. We’ve made this course to help you learn some of the confusing jargon and theories that are currently stopping you from becoming a whiz with design and rocking it out for your business. Take your design knowledge to the next level and feel confident creating Instagram posts, posters, flyers, and more! Fonts express different vibes and atmospheres and are important to all designs! Learn the difference between a serif and a sans serif font, a script font and a decorative font. Understand what each style of font subtly communicates to a viewer and how or why you might want to use it. Now that you know the theory behind colours and fonts, you can make smart choices on behalf of your brand to choose the styles that work best for your business or the particular design you’re working on. Colours have long held symbology and have been scientifically proven to have an effect on our brains and bodies - and we’ll break that all down for you so you understand the relevance behind each colour and what it can mean. Web design is a beast of it’s own, but to get you started we’ll be going through the top 10 rules you need to keep in mind as a beginner designer and show you how each one can be put to use if you’re DIY’ing your own website. You might have some questions about the Design 101 mini course, so let’s get to answering them! I use Canva, Squarespace and other programs that offer templates, do I need this course? Yes! Absolutely! Without learning the theory and the “why” behind each design or template you use, you won’t be able to make changes or come up with new ideas by yourself. Understanding the principles behind design (and getting an understanding of some of that annoying jargon) will help you be a more confident creator and of course, will benefit your business a ton if you can’t afford to work with a designer! Have you done that already? Are you still confused? Yep, we were too! Sometimes you need someone to guide you through the specific things that are most important for you, and that’s exactly what we’ve done here. Plus, once you’ve taken this course you’ll be ready to learn even more (through Google or another course) because you’ll finally understand the jargon and theories behind the basic principles. Unfortunately, no. Because we provide all the information immediately following purchase, the course content cannot be returned. But, we’ve got a feeling you won’t want that refund once you’ve received all the emails and have upped your design knowledge! If you do have a complaints or concerns please email Rosanna at hello@designbuildandgrow.com and she’ll be happy to discuss the options further with you. If you answered ‘Yes!’ to any of the above, then it’s time you take your design education to the next level!